NGHỆ AN – Thirty-seven fishermen have been rescued from sea by the central Nghệ An Province’s navy police force and other fishermen in the past few days. 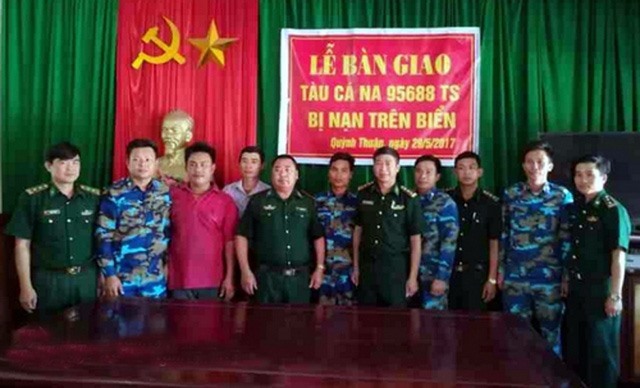 On Monday, Quỳnh Thuận District’s border guards, in co-ordination with the navy police, brought 19 fishermen from fishing vessel NA95688TS to shore after they were rescued from sea. The latest incident took place around 6pm on Sunday, when the fishing vessel owned by Bùi Ngọc Kiên, a resident of Nghệ An Province’s Quỳnh Lưu District, broke down suddenly in sea and started drifting away. The fishermen on board sent out an emergency signal following which the navy police received an order from the Command to go on a rescue operation. The navy police ship caught up with the drifting vessel a few hours later, around 00.30am on Monday. Earlier, on the afternoon of May 21, a local fishing vessel, captained by Nguyễn Bá Thảo, a resident of Quỳnh Lưu District, with 17 other seamen, broke down and went adrift in sea. On receiving their distress signal, two fishing vessels owned by local fishermen that were close by caught up with the drifting vessel.